We manufacture many embellishments and parts of the mannequins and sell them as well. We offer a wide range of specialty Mannequins Accessories such as head, torso, lower leg, chest etc., that are widely used for displaying Jewelry, hats, socks, stocking and a host of fashion accessories. We manufacture best quality Half Bust Female Mannequins for garment manufacturing companies and other related industrial units. Our Half Bust Female Mannequins are an exclusive option to display and showcase them. We are offering mannequins to our customers in affordable price. 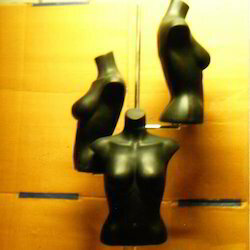 Looking for Half Bust Mannequins ?